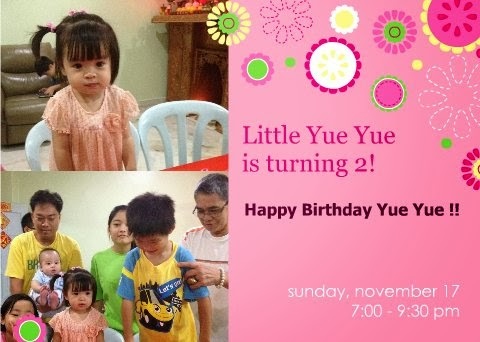 Last Sunday on 17 November 2013, Wai boy attended his 表姐, Yue Yue's birthday celebration at 爷爷's house. This would be the second birthday party that Wai boy had attended. For record purposes, the first one was celebrating grandma's birthday. Despite he has met up with most of our immediate family members during grandma's birthday but maybe because that was about 3 months ago, Wai boy still felt very uncomfortable and was quite clingy to me that night. Anyhow, Mommy believed that Wai boy too enjoyed himself at certain times especially during the cake cutting ceremony with candles lighting up despite only 2 candles and also the 'karaoke' time when all the kids were showing off their singing skill presenting the traditional birthday song before cutting the pinky Hello Kitty cake chosen by the birthday girl herself. Wai boy also joined in the fun but instead of singing (obviously he can't at this point in time), he was actually doing the '请请' by holding his two little hands together when the birthday song was sang and everyone was amazed. The party actually adjourned quite early at about 9:00pm mainly because the next morning is a working day for us parents and the kids still need to get up early to go to their grandparent and nanny's place respectively despite school holidays has already started. Furthermore, Wai boy was a little cranky towards the end maybe because it is time for sleep as he normally goes to bed before 9:00pm after his last milk. Overall, it was quite a wonderful gathering as we, adults get to chitchat with our family members and update on the lastest 'news' while the kids were having so much fun playing together with their cousins and nephews. Nice to attend birthday party.. Happy belated birthday to your cousin sister..